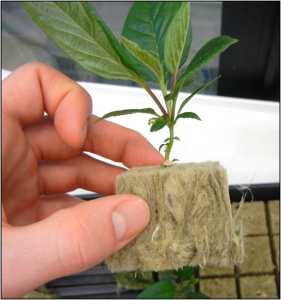 When I summed up the purposes of grafting, I warned you that grafting won't create more plants, just change a rootstock from one variety to another. So where do all those rootstocks come from? If you want to grow your own fruit tree rootstocks, you have two choices --- seeds or cuttings. Seedling rootstocks are easy to grow --- just collect pits from the fruit you eat and plant the seeds --- and seedlings have the benefit that they're usually vigorous and healthy. With some types of fruits, like peaches, a seedling roostock can be a good choice, but most homesteaders with a small backyard won't want to grow their apple rootstocks from seed since a standard apple tree can take over their entire growing space. Instead, nurseries count on carefully selected and vegetatively propagated rootstock varieties to change the size of their trees and to confer resistance to disease. 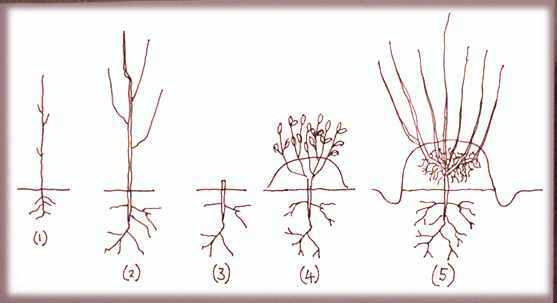 Vegetatively propagated rootstocks are much more uniform than those grown from seed, although you have to make an investment of space and time to grow your own. You can either root cuttings (softwood or hardwood) or use layering (a method of making one plant produce lots of shoots, which root and can be severed to create new plants). Garner notes that cuttings can usually be rooted for apples, pears, plums, and cherries, although my own experience has shown that softwood cuttings need a lot of babying and might not be worthwhile if you don't have the right equipment. Stooling is a type of layering that seems very easy for the beginner. You simply plant a purchased rootstock, let it grow for a year, cut the tree to the ground, then mound up dirt around the shoots to create new rootstocks that can be removed later. The downside of stooling is that it takes two years before you get your first harvest, but the stool can produce for twenty or more years after that. If we like the rootstock we use for our high density apple experiment, I think it would be worth starting a stool so that I could create our own dwarf apples in the future. Some more complex types of layering are used for various reasons. 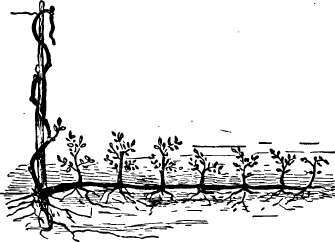 Etiolation (in which the shoots arising from the rootstock are pegged down in a trench) is used for shy rooters, like apples, pears, quince, plum, cherries, peaches, walnuts, and mulberries. Etiolation is more work than stooling, so should be considered only if you can't get your stock to root otherwise. Similarly, air layering (in which a shoot is injured and then surrounded with moist material to root above the soil line) is a very sure technique, but doesn't produce as many offspring. At the other extreme, tip layering is an easy way to get blackberries, some raspberries, currants, and gooseberries to root. No matter how you start our rootstocks, you need to grow the young plants until they're well rooted before grafting onto them. Budding is often done the first summer, but dormant grafting such as whip-and-tongue grafts have to wait another year. So, if you planted a rootstock from the nursery now, you could cut it to the ground to start a stool in fall 2013, mound up earth around the new shoots in 2014, cut loose your rootstocks that winter, and graft onto them in early spring of 2016. In case that seems daunting, I should tell you that you can often order rootstocks of named varieties from various nurseries. In addition, you should check with your local extension office since many run grafting workshops in the spring which provide all of the rootstocks, scionwood, and paraphernalia, allowing you to come home with several newly grafted trees for a very small fee. A final option is to skip the rootstock entirely and graft a new branch onto an existing fruit tree in your yard. I'd be very curious to hear from anyone who has grown his or her own rootstock. Which method did you use? Do you recommend it to others? The Weekend Homesteader walks you through fun and easy projects that fit into your free time. Thanks for the informative post! I enjoy Learning new stuff..so when the day comes I am ready to try some grafting, I've got a little background to start with. Enough to at least know where to look for more detailed instructions! You must read ALOT! Thanks for the very interesting grafting post. I have germinated several apple seedlings, and was thinking of grafting on to them. The vigour of seedling rootstock appeals to me, considering my poorer soil. Everyone says the tree will get too large for a backyard. But just wondering - why can't the size of a tree be controlled, to any size, by constant pruning ? Especially if only a few trees need to be pruned, so labour is not a problem. John --- Excellent question, and one I'll be experimenting with this coming year with our high density apple planting. The short answer is that if you just prune to keep a tree small, it will respond by sending up lots of vegetative growth and setting back its fruiting. However, it clearly can be done --- for example, the San Francisco forest garden we visited this summer had a miniature planting based on full-size rootstocks. And one of our readers does the same. I'll be figuring out the tricks and posting about them this year. The M9 series of dwarf rootstock are prone to suckering (lots of new shoots popping up from the roots around the base of the tree). While this is generally a nuisance, it is also a boon for us grafters. 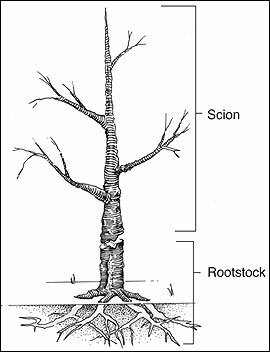 Dig down around the roots of your suckered tree (one side only, to prevent too much root damage from stunting the existing tree) and cut off the strongest looking suckers along with their root ball. 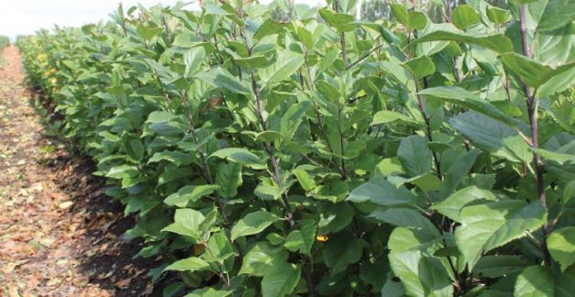 Pot up, or drop straight into the nursery patch and let them develop for a couple of years before cutting back and using as rootstock for your new tree. John --- I'll have to keep my eyes peeled for suckers! I have been eying a couple of suckers on the sides of the rootstock on my older, semidwarf trees --- I'm thinking I may mound up mulch around them in hopes of rooting them, then cut them free to start new trees. Sorry I didn't catch your name, but your informative article was exactly what I needed today. I just tried grafting with some M-27 and M-9 rootstock for some apples at my 2.5 acres in Idaho. It turns out that after my grafting attempts I have extra rootstock wood which I will try planting per your instructions. Wish me luck. Thank you for your valuable information. Footstools for cocktail stone fruit trees. Rootstock to start a stone fruit cocktail tree. There is little information on making a cocktail tree. A large healthy rootstook would be the beginning. The first scions I'd think would need to be compatible and a smaller variety than the rootstook. That should be the natural progression. No schematics seem to be available. I don't understand the secrecy. You can't sell one of these trees but one could make some money selling schematics.